We are situated at the immediate vicinity of the tourist trail leading to one of the most beautiful places of the High Tatras, the Morskie Oko (Eye of the Sea). It is the largest mountain-lake in the High Tatras, lying on the Polish side of the mountains, under the peak of Rysy. It lies in an altitude of 1395,4 metres above sea level and has a glacier origin. The surrounding peaks stand over 1 000 meters above the water level. From the lake you have a view on the Mengusovky peaks – the Large Mengusovsky (2 431,5 meter above sea level), Nizny (2 098,1 m a.s.l.) and Vysny Zabi peak (2 262,8 m a.s.l. ), Rysy (2 499 m a.s.l.) – the highest peak of the Polish Tatras and the Mnich peak (2 068 m a.s.l.). The area of the lake is 34,93 hectares, its deepest part is 50,8 meters deep and the length of its shoreline is 2 613 meters. The length of the lake is 862 meters, its width is 566 meters. The name “Morskie Oko” translates to “Eye of the Sea”; this is derived from an old legend, according to which the lake was connected to the sea via an underground passage. Morskie Oko is one of the most popular destinations in the Tatras, often receiving over 50,000 visitors during the vacation season. It is reached by foot in about two hours from the nearest road that allows motorized access. Many other tourists opt to take the journey by horse-drawn cart, a large number of which are operated by the local Górale inhabitants. 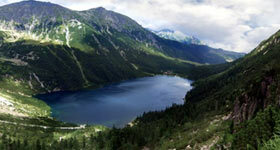 The earliest documents in which Morskie Oko is mentioned date back to 1575. In 1637, the Polish king Władysław IV granted Wladyslaw Nowobilski the right to use the pastures adjoining the area. In 1824, during Partitions of Poland, Morskie Oko became private property for the time being, when Zakopane estate, including Dolina Rybiego Potoku, were purchased from the Austrian authorities by Emanuel Homolacs. At the end of the nineteenth century, a boundary dispute arose between Galicia and Hungary over property rights to the lake and adjoining area (the so-called “Morskie Oko dispute”). The Court of Conciliation in Graz ruled in favor of the Polish side. The decision is credited to Oswald Balzer, who represented the Galicia government. Morskie Oko was “rediscovered” for tourism by Dr. Tytus Chałubiński in the mid nineteenth century; the first shelter was built there in 1836 but burned down in 1865. A second shelter, built in 1874, burned down in 1898. In 1902, a road from Zakopane was completed and named the Oswald Balzer Road. Since 1933 following the return of sovereignty, the lake has been owned by the Polish state.